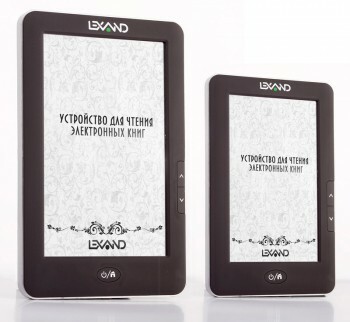 The Russian gadget maker Lexand just unveiled 4 new ereaders, and it looks like they're going for variety. The 4 gadgets come in a variety of screen sizes, and they started shipping a few weeks ago. First up is the LE-116. It has a 6" E-ink screen, 4GB Flash storage, a microSD card slot, and some type of touchscreen (the listing isn't specific). Format support includes pdf, word, excel, txt, epub, fb2, html, tcr, PalmDoc, chm, oeb, and it can also play MP3, WMA, WAV, AAC. The LE-116 is actually Lexand's second E-ink ereader; last fall they introduced the LE-106, which also had a 6" E-ink screen. And then we have a trio of ebook readers based on LCD screens, the Lexand LT-114, Lexand LT-115 and Lexand LT-117. They seem to be closely related devices, with the only difference being the size of the screen: 4.3", 5", 7". All have 4GB Flash storage, a microSD card slot, and FM radio. They also have the same audio, video, and ebook format support: TXT, HTML, FB2, EPUB, PDF, PDB, DOC, RTF, MP3, WMA, RM, RMVB, 3GP, FLV, AVI, MP4, VOB. Well, this is a change. I haven't seen this kind of brash introduction of multiple new models since last year. I think Elonex may have been the last company to release several models at once, and that was well over a year ago.